Enterprise users get more control over encryption keys. 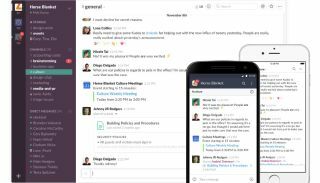 As of today, Slack’s enterprise users will have control over their encryption keys thanks to a new feature called Enterprise Key Management (EKM). In a blog post on the new offering, Slack says the encryption keys will be handled by the AWS KMS key management tool. The company hopes this tool will come as super handy for organisations in highly regulated markets, where a tight grip on data and its security is paramount. “Organizations that are security-minded, especially in highly regulated markets—such as financial services, health care and government—are typically underserved in terms of which collaboration tools they can use, so we wanted to design an experience that catered to their particular security needs,” said Geoff Belknap, chief security officer (CSO) at Slack. At the moment, Slack encrypts data in transit and at rest. New tools will give users more control over the encryption keys. Belknap says there are many benefits to the new offering, but two of the biggest ones are control, and insight. “You, the customer, are in full control over your own encryption keys and when or if you want to revoke them,” he said. EKM for Slack is available as of now for Enterprise Grid customers, for a few extra greens. Slack announced going public last month, and has raised more than a billion dollars on a $7bn valuation.